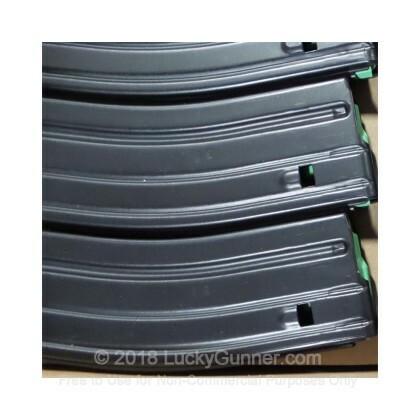 There are lots of great AR-15 magazines on the market, but you can't go wrong with mags from D&H, which also produces the mags used by the US military and many law enforcement agencies as well as allied nations. These magazines hold 30 rounds of 5.56 NATO/.223 Remington ammunition (observe local laws when ordering). Each magazine is made of 6061-T6 aluminum with a black finish and 17-7PH stainless steel springs. These magazines have mil-spec green followers. D&H Industries is a Wisconsin-based manufacturer of stamped metal products and a defense contractor serving both the US armed forces and those of allied nations. Many law enforcement agencies also use their products. D&H and its predecessor companies (LaBelle, later known as Quest) have been involved in producing M-16 magazines for many decades. Q: does the mag have an anti tilt follower...? A: Hello Jim, This magazine uses a standard mil-spec green follower.